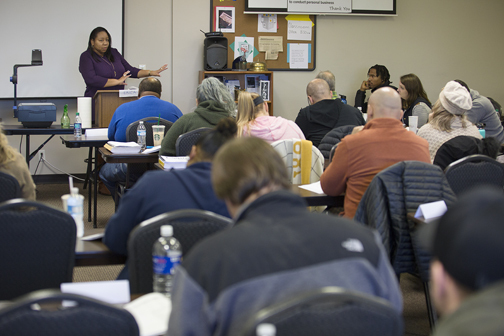 Instructor Erica Mayo teaches a class at CLI (Continual Learning Institute) in Green Hills. There are really only two difficult things about the job of selling homes, says Cindy Perling, a broker with Crye-Leike who has been in the residential real estate business in Nashville for more than 25 years. Steve Condurelis, with Keller Williams, sees real estate as a 90-10 industry, explaining that 90 percent of agents will quit within two years. National Association of Realtors’ Quick Real Estate Statistics, issued last May, show the median number of residential transaction sides (representing a buyer or seller in a transaction) was 11 in 2017 for all Realtors. The median for residential specialists was 12. Most Realtors worked 40 hours per week in 2017, earning a median gross income of $39,800. That was down from $42,500 in 2016, NAR reported. Area real estate agents say it’s common for real estate agents to move from firm to firm, looking for the firm that best meets their needs and helps them maximize their income. The NAR Quick Statistics showed that its members stayed with a firm for an average of four years. As of last December, the state of Tennessee had issued more than 35,000 active individual real estate licenses and listed more than 4,400 active real estate firms.